How to hedge against a small cap crash? The small cap index has lost nearly 16% since the Union Budget announcement. Is it too late to hedge or can one still look at hedging against a small cap portfolio? 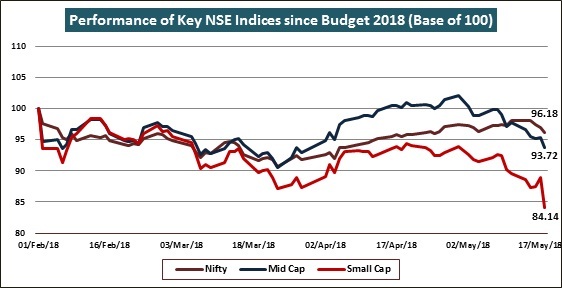 If one were to look at the market very intuitively since the Union Budget 2018 was announced on February 1, one thing that emerges clearly is that the mid caps and small caps have underperformed as compared to the large caps. To get a more factual picture, let us look at how the Nifty Index, Mid Cap Index and the Small Cap Index have performed post the Union Budget 2018. While the Nifty has lost less than 4% since the Union Budget, the mid-cap index has lost close to 7% since the budget. But the real price damage is visible in the small cap index, which has lost nearly 16% since the Union Budget announcement. Is it too late to hedge or can one still look at hedging against a small cap portfolio? Obviously, the small cap portfolio looks a lot more vulnerable at this stage. Here are 5 techniques that investors in small caps can adopt to reduce their losses and salvage value out of their portfolio. Firstly, put your small cap portfolio in perspective. While stock selection is the key in a small cap portfolio, you must also ensure that you respect the weights assigned to different types of equity portfolios. For example, if your overall equity weight as per your financial plan is 50% and your break-up of large-caps/mid-caps/small-caps is 70/20/10, then maintain that discipline. This will have two advantages. Firstly, it will ensure that your small cap exposure never crosses the limit and secondly, when the portfolio appreciates and weightage crosses the limit you automatically book profits. As long as you are within the confines of your financial plan allocation, your small cap portfolio will have an in-built hedge. There is a popular aphorism in the markets that, “When in doubt, stick to the leaders”. Even within the small cap names there are tried and tested names that would have given you healthy returns over the last few years. These are the stocks you must look to add at lower levels. If you have got into a stock for pure speculative reasons, then keep a strict affordability stop loss and exit these stocks. In situations like these, when the small caps are sharply down, it is the right time to increase your small cap bias in favour of tested names. One method that is considered by many investors is to buy Nifty puts against your small cap portfolio. That may not really work because if your small cap portfolio is down by 16% and your Nifty is down by just about 3%, then you do not really get a hedge. The correlation between the Nifty index and small stocks is quite low. A better way to hedge would be spread your small cap risk across a wider portfolio. Exit stocks that are concentrating risk in your portfolio, add stocks that are reducing your overall risk in small caps and use this opportunity to restructure and reallocate your entire small cap portfolio. One of the best ways to hedge against a small cap correction is to adopt a phased approach or a SIP approach. You are surely familiar with the concept of rupee cost averaging that adds value to your portfolio in the long run. When you adopt a phased approach in a volatile space like small caps, you can actually buy quality small cap stocks at bargain prices. The circle of competence is an interesting concept in small cap stocks. What do we understand by the circle of competence? Every investor has an area of specialization. For example, if you are working in the steel industry, then your fundamental understanding of the steel industry will be much stronger and that will be an advantage. You will be a good judge of when steel companies are doing well and when they are lagging. You can argue that steel companies are large and they cannot fit into a small-cap portfolio. That is absolutely fine! If steel companies grow then you will need more electric arc furnaces and so graphite companies will benefit. Those are small cap stories. In volatile times, the best hedge is to stick to your circle of competence. It not only reduces your risk but also helps you identify interesting buying opportunities.